From the Archive: A British Television Blog: Is Love Like a BBC Butterfly? I talk a lot about my remembrances of when I was young and started to watch British television. It was a naïvely happy time of getting into something that would have a strong impact on my life. It was all new to me. I think most people who discovered a love and soon passion for this genre may have started out the same way but maybe took some different direction. Being in the US, my love for British television started with Doctor Who. This is no revelation from me and I would guess that quite a few of the US viewers who got into British television via PBS would possibly have started the same way. I was only 9 years old or so when I got into yet but to think of a time without British television or Doctor Who in my life fills me with anxiety. Through these programs, I have experienced so much in my life that started with these programs. It’s a period of time when watching a favourite program transcended into meeting people and making lifelong friendships. It’s hard to believe that I started on this journey in 1984 and really got active in 1988. It’s just four years but at the time and even now it seems like there was a ten year gap between the time I started to watch these programs and when I got involved and started to meet people with like passions. Who would have thought that a comedy series from 1978 would have been so instrumental in my love for all thinks British. What makes it so interesting is as a 9 or 10 year, there is much of this series that would have gone over my head. There are themes and scenarios that I wouldn’t have picked up on which are actually the basis for the series. These are not one-off plot points but actual over-riding arcs that go beyond the whole series. Yet, when I watched it, I loved it. It doesn’t answer the question of why? Butterflies is a wonderful BBC series that ran from 1978 to 1983 taking some time off in-between to complete four stellar series. It’s written by Carla Lane. She created, amongst other things, the ground breaking series The Liver Birds. 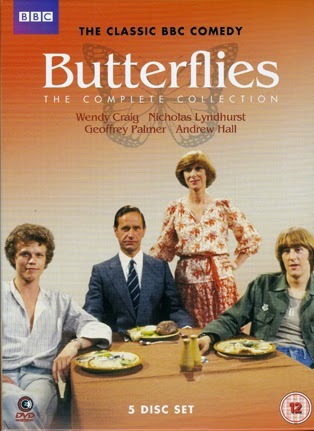 Butterflies stars Wendy Craig, Geoffrey Palmer, Andrew Hall, Nicholas Lyndhurst and Bruce Montague. The theme song was sung by Clare Torry which is a cover of the song “Love is Like a Butterfly” from Dolly Parton. Those are the basic facts yet these are the building blocks of what would put me on a road that has lead me to where I am today. It’s really tough to peg Butterflies because I think it is more than a comedy but it’s not drama. Butterflies is about life crisis. From initial viewing, I think we could say that the life crisis just concerns Ria who is the mother of the family but I think you could put a life crisis for each character. Ria is middle aged and is suffering from a mid-life crisis. She is smart and creative. I think it must have been odd for viewing audiences to see a mother that is not so traditional, yet Ria tries. She tries to cook and fails. She lets her imagination run away with her which is actually an endearing quality. It’s sad because she tries and no one really listens or take her seriously. She is taken for granted. Her husband Ben might be labelled as the “long-suffering husband” but when viewing this years after seeing it as a child, it is sometimes harsh to see how he treats her. He is not a mean person. He is more traditional in his ways but is frightened by the modernization his children bring into his life. He is generally a stick in the mud because he doesn’t know how to really say what is on his mind. He is a dentist and clearly has provided his family a comfortable middleclass lifestyle. This is enough that makes him believe that he should be treated with more respect. Ria can’t cook and it appears everyone woman in Ben’s life never could cook so maybe he has never had a good meal in his life. I think it is interesting that in the first episode of the series, Ben is a much harsher character in every way. He is written and played as a stereotypical husband who sits at the table demanding his food. He is rude and barks orders. When I was re-watching the episode for this article, I was in shock as that was not how I remembered him. Luckily, by Episode Two, he was much milder. He still was bad-tempered, uptight and grouchy but done more light-heartedly and humourous. More so, he was endearing. One could see why Ria fell in love with him. Oh, did I mention that his hobby is collecting butterflies? Hmmmm….. The kids are Adam & Russell. They are not far a part in age and get along very well. They are a little older probably reaching around 18 to 20 and are good kids. They don’t have jobs which is a big problem for Ben. He sees what his children are doing is directly tying into the crumbling of the moral fiber of Britain. I think Ria is actually exhilarated by this because she can see that they both have the creativity and imagination that she has. She doesn’t want to grow up and I think she is envious of them to that so is Ben. That being said, the series really starts because of one man named Leonard enters into Ria’s life. Leonard is in his mid-40s and has been recently divorced. As much as he seems like a nice guy, what he really wants to do is tempt Ria away from her family because he is infatuated with her. 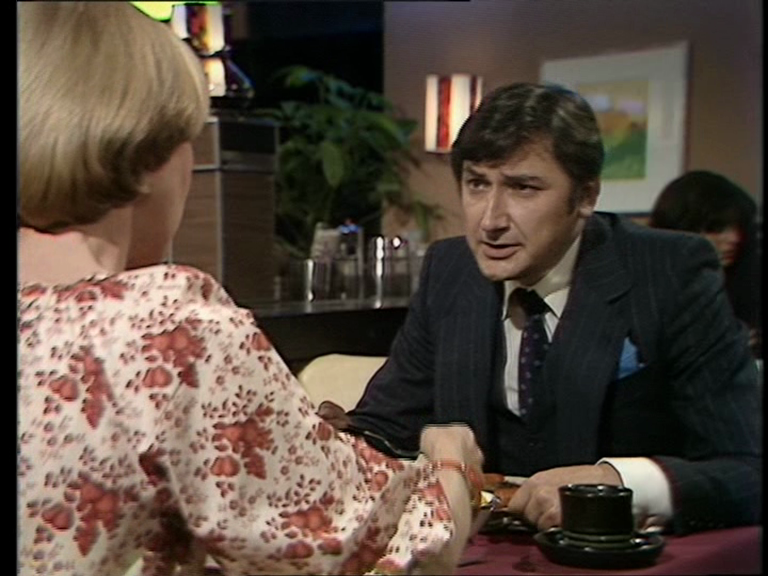 Ria meets Leonard in the first episode at a café. This is something I am not familiar with as we don’t do this in Minnesota but in this place, strangers will sit together at the same table at a restaurant. It’s odd to me but makes sense. This sort of thing also happens in LA and New York. There is a similar type scene in The Fall and Rise of Reginald Perrin. They strike up a conversation and it is clear they have a connection of sorts except that Ria is married. 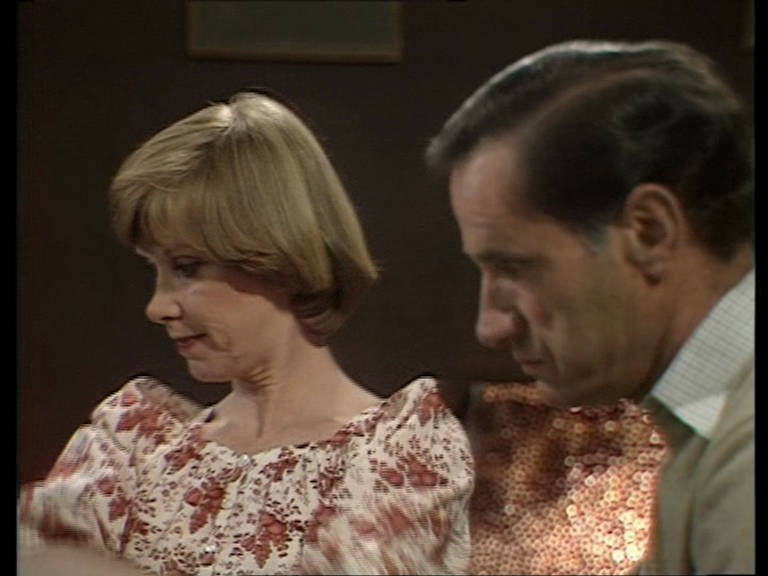 She gives the impression she is happily married but she does keep talking with Leonard. Ria isn’t really the one to seek out Leonard, Leonard’s infatuation brings him to try a lot of things to get her to come around. It’s all done in a gentlemanly sort of way but he is pretty persistent. When he gets frustrated or storms off, Ria will often go after him. Leonard is a self-made man who does alright for himself. I am sure to Ria, he seems exciting and worldly. Ria accepts Ben for who is he but can’t help but to acknowledge how exciting it is to be pursued by someone else. It is clear she likes the attention. Each episode of Series 1 has a plot to it but the main driving force of the episodes is the way that Leonard tries to stay in Ria’s life. 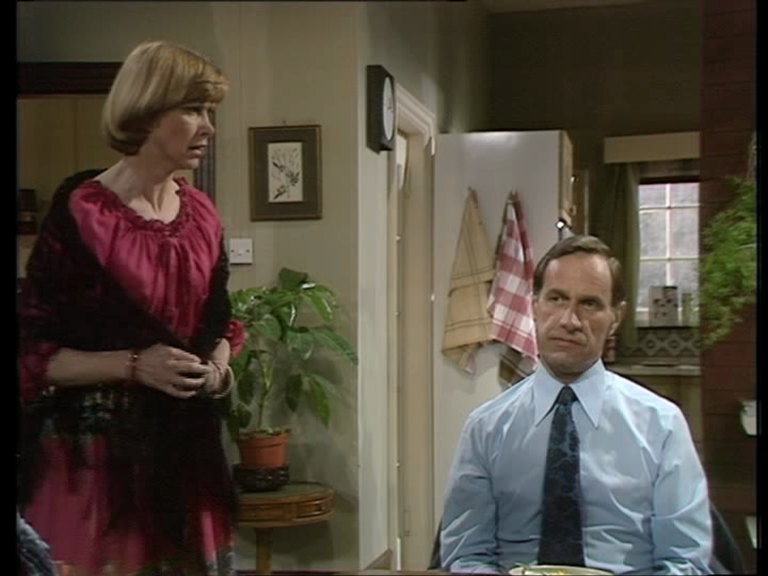 It is interesting because after their first encounter at the café where Ria unknowingly flicked cigarette ash in Leonard’s trifle and spilled his coffee all over the place, she actually told Ben about it. After that, she doesn’t talk about Leonard to Ben again. As mentioned above, another theme throughout the first series is how Russell and Ben have their differences. In the first episode, they haven’t spoken for a year. They only start talking again in Episode Two but then stop in Episode Three to start up again later. Adam and Russell mean no harm but they don’t always think which leads to them innocently breaking Ben’s butterfly net and other foolish things which is a problem. 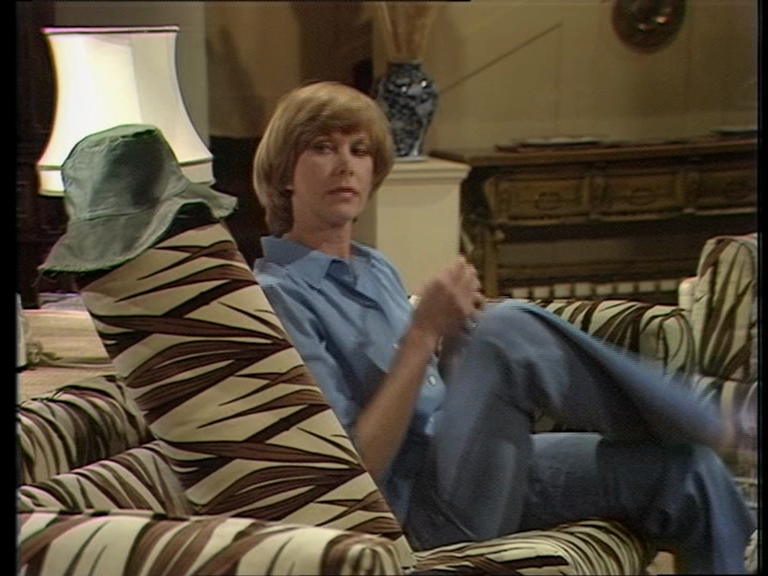 There is a great bit of dialogue in Episode Two where Ria takes Ben’s butterfly catcher hat and puts it in the sofa pillow and has a conversation with it basically insinuating that it is basically like speaking with the real Ben. In this dialogue, she lets it go. She talks about how she wants to run through Harrods and shout Woolworths! By the time she gets to the end of the dialogue, she goes through what she wants to do for the week and ends it by saying on Friday she will kill herself. You never get the impression she means it but even so it is such a powerful statement because this bubbly woman who is doing the best she can with a family who intermittently communicates with each other is, in fact, very unhappy. Right before the cleaning lady comes into the living room, she exclaims, “I want to be raped!” It is such an interesting thing to hear being said from a mother and the star of the show. It’s not too surprising. Part of why I love this series and the productions from this era and this look is that I am a real big fan of interiors being shot on video and exteriors being shot on film. I love it! 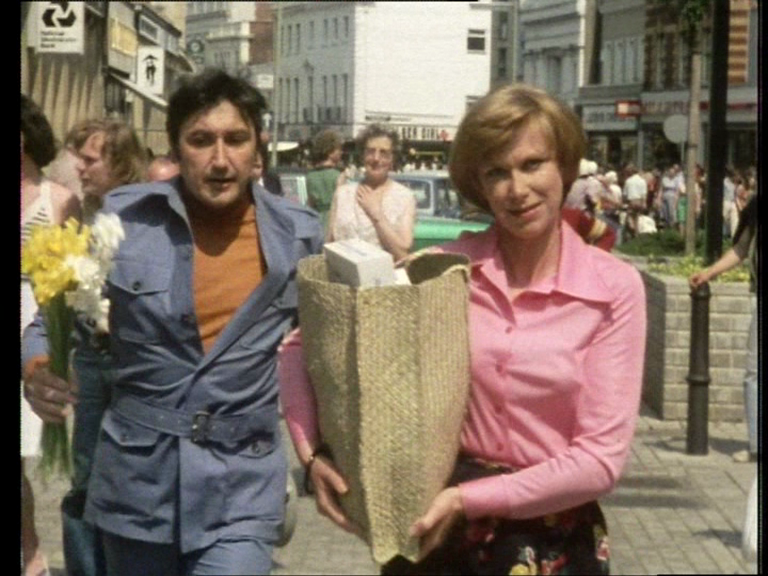 There is a great shot in Episode Two while Leonard and Ria are walking down a bust street in a market. No one else in that shot are actors and it shows. The film cameraman is in front of Ria and Leonard shooting them but the people behind Ria and Leonard are not sure if they should keep walking in the same direction, duck out of shot or just gawk. It’s magical! Some things are not quite so magical such as the disgusting food Ria makes in every episode. Ria can’t cook. Sometimes it looks so bad that when she is asked what it is, she can’t remember because it is no longer recognizable to her. Did Jack Kine’s group for BBC special effects make the food? Sometimes they actually have to eat it! Blah! So, to get back to my original question above as to why this series had such a strong impact on me. 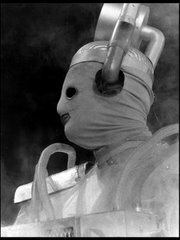 When I was 9 or 10 and first started to watch Doctor Who, I started to become interested in all thing British which would last to this day. When I started to really get into Doctor Who, I wanted to watch more series from the BBC and started to watch anything that my local PBS station KTCA would show. Obviously, one of the first I would watch would be All Creatures Great and Small but Butterflies just so happened to be on at the time and I started to watch it. I remember it would be on first at 10pm and then followed by another comedy series Brass. I never got into Brass and to this day have never seen it again. 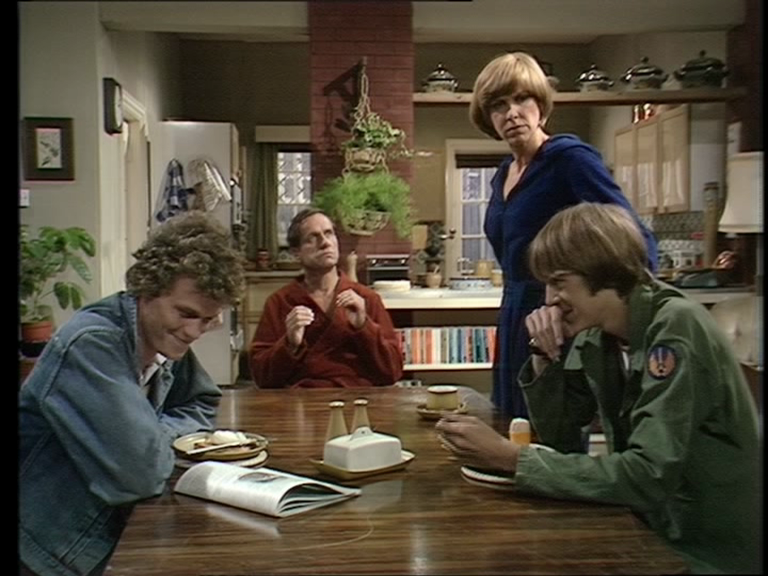 I remember while my Dad was away on a work trip, I watched the final episode of Butterflies in my parent’s bedroom and fell asleep. I will try not to overwhelm you with any more interesting stories like this. I ended up loving everything about Butterflies when I first saw it at a young age. I loved the look of the house they lived in, how the phone would ring and even how the phone looked. I loved how Britain looked in the episodes and I loved Russell’s car which was painted as a Union Jack. I fell in love with the UK through this series. My love for the UK had never dwindled. Once in the late 1990s, I was very close to moving over there. I was working with a company that placed people at jobs over there. I was very close. I was packing my stuff, that’s how close I was. I was placed to work over there. Then I met someone and changed my mind. I, obviously, ended up staying here. Do I regret it? No. Is there a possibility that I may move out there someday? Maybe! As I mentioned how I fell in love with every aspect of the series, I really loved the opening titles to Butterflies. 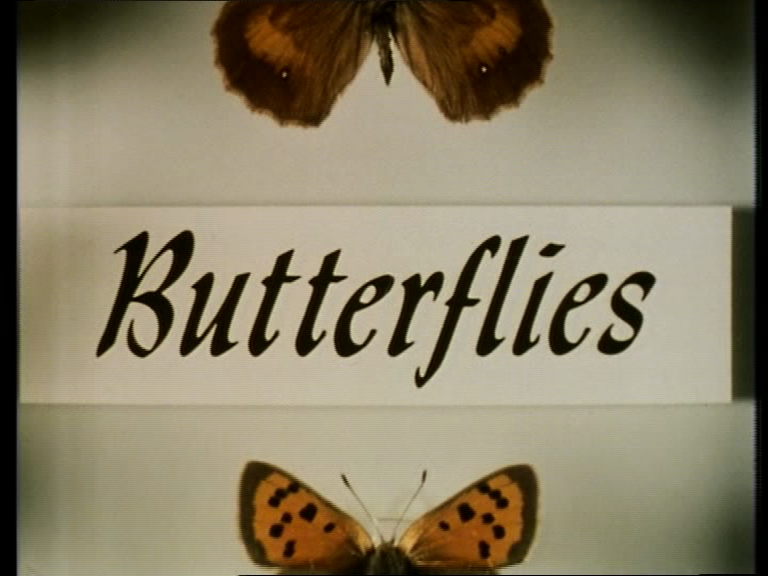 The premise of the opening credits is a display case of the butterflies caught with the name of the series and the stars in it. I make that sound macabre. They are not pinned in there like specimens. They are very casual. The theme music is my favourite. It was written and originally recorded by Dolly Parton in 1974. The version for the BBC series was recorded by Claire Torry and it is easily my favourite rendition of it. It is more airy and whimsical. It is beautiful. Up to literally 1 day ago, I did not realize Claire recorded a full version of the song. I had only heard the version used in the opening and closing credits. Below is the version. It is wonderful. It was also very emotional for me to listen to this because it just opened up all sorts of wonderful memories of my youth. I never knew there was a full version so it was almost like finding a lost treasure! Butterflies, as most other popular series, have been released many times on different home media formats. My favourite is probably the recent purchase I made from eBay which is the first four episodes of the series from BFS video……on beta! How cool! Like I don’t have enough crap in my house already. 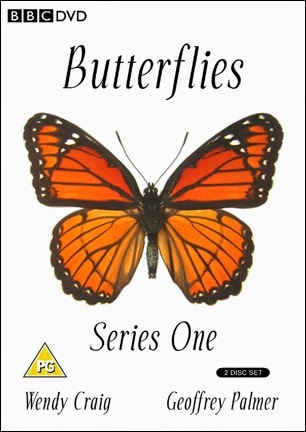 At one time I made my own DVD covers for each series of Butterflies. See below, I prefer mine more but of course I would say that. Finally, I work at an advertising agency where we sometimes have a fair amount of fun. Sometimes, if someone leaves their computer unlocked and walk away from it, someone else will get on it and type an e-mail to the whole agency (about 250+ people) looking like it came from the person who own that computer. Such e-mails could be sent from a guy’s computer saying something in the subject line like, “Do I look fat today?” As you can imagine, hilarity ensues. One day, my friend/co-worker Mike left his computer open and I couldn’t resist. I don’t think Mike ever knew it was from me. Next week: How odd it was when I realised that I randomly picked something to watch on November 22 that had to do with the JFK assassination yet was made in the UK. Next week, I look at the 1966 Play of the Month installment Lee Oswald: Assassin. This is directed by Rudolph Cartier and was the first dramatization of anything regarding the events of the Kennedy assassination ever made. How did they do? Thanks for another great article on one of my favorites. I hadn't ever bothered to look for the full version of the theme, nice bonus. And of course Clare Torry is perhaps best known for providing the vocals on Pink Floyd's The Great Gig in the Sky from Dark Side of the Moon. I never thought of looking to see if there was a full version either of the song until a couple of days ago. It was really a special moment finding it and I immediately had you in mind wondering if you had ever heard the full version before. I was and still am a huge fan of Butterflies which I began watching on it's original broadcast when I was thirteen years of age. Despite my young age the sitcom was saying something that I connected with and understood. I was unhappy in my life so i guess I was interested in a character that was unhappy in their life. Its quite telling that I am also a fan of The Fall & Rise Of Reginald Perrin. I guess that I must have watched Butterflies from about the same age as you, at least series 1, as I was none or ten when it began in 1978. It probably led to me being slightly anxious about the adult world and whether my mum and dad were well-matched, as I could see a lot of my mum in Ria. Amazing to think Wendy Craig's been in showbiz for 60 years or so.